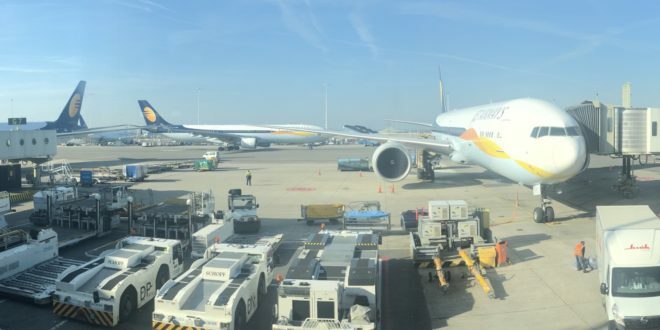 Four 777-300's of Jet Airways at Amsterdam. Continuing from yesterday, when the airline cancelled its international flights from Bangalore and Chennai. Jet Airways now appears to have cancelled all its flights to London, Paris and Amsterdam. All flights to the above cities have been cancelled for today, they are currently showing as scheduled for tomorrow. 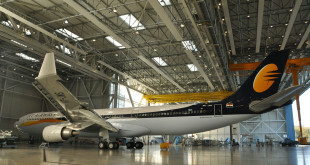 However, it is uncertain that Jet will be able to resume these flights in its current condition. The reasons for the cancellations are unknown – but it could be that the airline does not want to risk any more aircraft being seized outside the country. VT-JEW is still on the ground at Amsterdam. It could also be that the airline does not want to drive up more liabilities and have grounded the aircraft. It is also possible that now that the airline has less than 20 aircraft in its fleet, it is no longer allowed to operate international flights. The airline has also cancelled all of its Bangalore flights. Jet did not operate any flights from Bangalore yesterday and shows all flights scheduled for today and tomorrow cancelled. The last count indicates that the airline may not have any operational 737s in the fleet that can operate domestic flights from Bangalore. Jet’s domestic fleet now appears to have mainly been reduced to its ATR-72s.